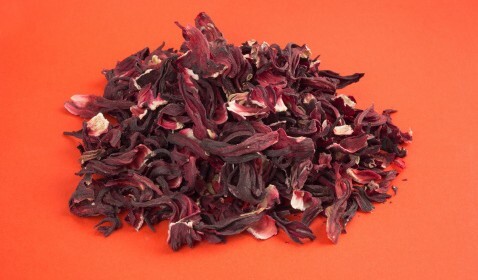 Also known as sour or roselle tea, there are many questionable health claims surrounding Hibiscus tea. But there is solid clinical evidence that it helps lower blood pressure, especially in those with existing high blood pressure (hypertension). In a study of 75 subjects with diagnosed hypertension (and not taking any other supplements or blood pressure lowering medications at the time), one large hibiscus tea before breakfast each day for 4 weeks was associated with an 11% reduction in systolic blood pressure (top reading) and 12.5% reduction in diastolic blood pressure (bottom reading) (1). Those effects were equal to the active control group who were taking 50 mg of captopril (prescription medication) daily for the same time frame. The most exciting part is that numerous other studies have replicated these results, with beneficial effects seen in as little as two weeks (2, 3, 4). There’s only a select few natural remedies that are clinically proven to work just as well – if not better – than pharmaceuticals (ginger being another that comes to mind). As tea, about one gram of dried calyx (the part of the flower directly beneath the petals) should be brewed. It should be enjoyed either once in the morning or twice per day but with at least 8 hours between drinks. Alternatively, hibiscus supplements are also effective, and should be dosed according to their anthocyanin content. A daily 10mg dose of hibiscus anthocyanins – equivalent to 1g of a 1% extract or 500mg of a 2% extract – is optimal, but I wouldn’t go any higher than that. There are many more herbs and spices that contain medicinal properties, particularly around managing high blood pressure. If you’d like to learn more, come see us here Darwin Dietitians. Simply call us on 08 8911 0622 or enquire online here.